I am going to break with my normal pattern with Jeremiah and put the text after the reflections. It didn’t make sense to me to cover these two chapters as separate because they are both a part of a long conglomeration of oracles against Babylon, set by the text in the fourth year of King Zedekiah (in the time between the first exile where leadership are taken into exile and the main exile where the largest group is taken into exile in Babylon). To place this oracle against Babylon coming from the mouth of Jeremiah combined with the sign act of throwing the scroll into the Euphrates by Seraiah seems to run against everything else Jeremiah is saying at this time. Many historical critical scholars would argue against this being composed by Jeremiah but the reality is that we have this massive book which we now receive as the book of Jeremiah and there is no way to go back to the ‘authentic words of Jeremiah’ or to tell exactly what Jeremiah the prophet wrote and some later compiler. I take this long scream against the Babylonian empire about its coming destruction much the same way I take Psalm 137 which is a cry out of pain. The people of Judah after encountering the destruction of all that they know need some hope that God has not abandoned them to their fate, that Babylon is far from blameless and must also answer for its sins. The images and idols of Babylon are not more powerful than the LORD of hosts and will be put to shame and the armies which were viewed as an instrument in the LORD’s hands throughout the rest of the book now will have other armies from the north that come an terrorize them. The poetic language of disasters follows patterns seen throughout Jeremiah: beasts, arrows, clubs, violence. Warriors in misogynistic language become women, walls become leveled, honor becomes dishonor. Just as there was no balm for Judah and Jerusalem, now there is no balm for healing Babylon. Babylon would fall to the Persian empire under Cyrus the Great, who the book of Isaiah lifts up as a messiah-which literally means anointed one as it is typically translated in English (see Isaiah 45:1). It is in the continuing movement of armies and the realignment of power in the Middle East that the people in Babylon would be able to return to rebuild the city of Jerusalem, the temple and re-settle Jerusalem. Perhaps a part of this oracle which encourages people to leave Babylon also speaks to the reality of those born and raised in Babylon that have become accustomed to life in the Babylonian empire and an encouragement to return back to Judah. Things are never as neat and tidy as they come out in oracles. Babylon would be conquered, but like Judah it never truly becomes a haunt of jackals, a place uninhabited that people avoid for all times. Babylon will be integrated into the next empire and the chain continues. Jerusalem and Judah are never the same again as well with the majority of the Jewish people being dispersed across the region from Egypt to Babylon to Asia Minor. In these chapters a powerless people hope for powerful actions by their God to deliver them again from their captivity. Much as in the founding story of the Exodus, now the hope is that God will see and hear God’s people’s plight in a foreign land and act to bring them back home again. do not conceal it, say: Babylon is taken, Bel is put to shame, Merodach is dismayed. Her images are put to shame, her idols are dismayed. 3 For out of the north a nation has come up against her; it shall make her land a desolation, and no one shall live in it; both human beings and animals shall flee away. 4 In those days and in that time, says the LORD, the people of Israel shall come, they and the people of Judah together; they shall come weeping as they seek the LORD their God. 5 They shall ask the way to Zion, with faces turned toward it, and they shall come and join themselves to the LORD by an everlasting covenant that will never be forgotten. 8 Flee from Babylon, and go out of the land of the Chaldeans, and be like male goats leading the flock. 9 For I am going to stir up and bring against Babylon a company of great nations from the land of the north; and they shall array themselves against her; from there she shall be taken. Their arrows are like the arrows of a skilled warrior who does not return empty-handed. 10 Chaldea shall be plundered; all who plunder her shall be sated, says the LORD. 12 your mother shall be utterly shamed, and she who bore you shall be disgraced. Lo, she shall be the last of the nations, a wilderness, dry land, and a desert. shall be appalled and hiss because of all her wounds. spare no arrows, for she has sinned against the LORD. For this is the vengeance of the LORD: take vengeance on her, do to her as she has done. and all of them shall flee to their own land. 17 Israel is a hunted sheep driven away by lions. 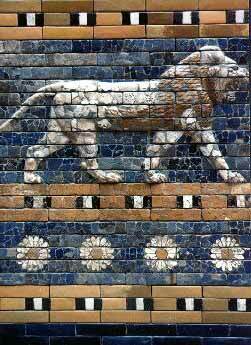 First the king of Assyria devoured it, and now at the end King Nebuchadrezzar of Babylon has gnawed its bones. 18 Therefore, thus says the LORD of hosts, the God of Israel: I am going to punish the king of Babylon and his land, as I punished the king of Assyria. 19 I will restore Israel to its pasture, and it shall feed on Carmel and in Bashan, and on the hills of Ephraim and in Gilead its hunger shall be satisfied. 20 In those days and at that time, says the LORD, the iniquity of Israel shall be sought, and there shall be none; and the sins of Judah, and none shall be found; for I will pardon the remnant that I have spared. do all that I have commanded you. 22 The noise of battle is in the land, and great destruction! 23 How the hammer of the whole earth is cut down and broken! How Babylon has become a horror among the nations! because you challenged the LORD. for the Lord GOD of hosts has a task to do in the land of the Chaldeans. pile her up like heaps of grain, and destroy her utterly; let nothing be left of her. 27 Kill all her bulls, let them go down to the slaughter. Alas for them, their day has come, the time of their punishment! 28 Listen! Fugitives and refugees from the land of Babylon are coming to declare in Zion the vengeance of the LORD our God, vengeance for his temple. 29 Summon archers against Babylon, all who bend the bow. Encamp all around her; let no one escape. Repay her according to her deeds; just as she has done, do to her– for she has arrogantly defied the LORD, the Holy One of Israel. 30 Therefore her young men shall fall in her squares, and all her soldiers shall be destroyed on that day, says the LORD. for your day has come, the time when I will punish you. and I will kindle a fire in his cities, and it will devour everything around him. 33 Thus says the LORD of hosts: The people of Israel are oppressed, and so too are the people of Judah; all their captors have held them fast and refuse to let them go. 34 Their Redeemer is strong; the LORD of hosts is his name. He will surely plead their cause, that he may give rest to the earth, but unrest to the inhabitants of Babylon. and against the inhabitants of Babylon, and against her officials and her sages! 36 A sword against the diviners, so that they may become fools! A sword against her warriors, so that they may be destroyed! and against all the foreign troops in her midst, so that they may become women! A sword against all her treasures, that they may be plundered! 38 A drought against her waters, that they may be dried up! For it is a land of images, and they go mad over idols. 39 Therefore wild animals shall live with hyenas in Babylon, and ostriches shall inhabit her; she shall never again be peopled, or inhabited for all generations. 40 As when God overthrew Sodom and Gomorrah and their neighbors, says the LORD, so no one shall live there, nor shall anyone settle in her. a mighty nation and many kings are stirring from the farthest parts of the earth. 42 They wield bow and spear, they are cruel and have no mercy. they ride upon horses, set in array as a warrior for battle, against you, O daughter Babylon! anguish seized him, pain like that of a woman in labor. 44 Like a lion coming up from the thickets of the Jordan against a perennial pasture, I will suddenly chase them away from her; and I will appoint over her whomever I choose. For who is like me? Who can summon me? Who is the shepherd who can stand before me? 45 Therefore hear the plan that the LORD has made against Babylon, and the purposes that he has formed against the land of the Chaldeans: Surely the little ones of the flock shall be dragged away; surely their fold shall be appalled at their fate. 46 At the sound of the capture of Babylon the earth shall tremble, and her cry shall be heard among the nations. 2 and I will send winnowers to Babylon, and they shall winnow her. They shall empty her land when they come against her from every side on the day of trouble. 3 Let not the archer bend his bow, and let him not array himself in his coat of mail. Do not spare her young men; utterly destroy her entire army. 4 They shall fall down slain in the land of the Chaldeans, and wounded in her streets. though their land is full of guilt before the Holy One of Israel. 6 Flee from the midst of Babylon, save your lives, each of you! he is repaying her what is due. the nations drank of her wine, and so the nations went mad. 8 Suddenly Babylon has fallen and is shattered; wail for her! Bring balm for her wound; perhaps she may be healed. 9 We tried to heal Babylon, but she could not be healed. for her judgment has reached up to heaven and has been lifted up even to the skies. come, let us declare in Zion the work of the LORD our God. 11 Sharpen the arrows! Fill the quivers! The LORD has stirred up the spirit of the kings of the Medes, because his purpose concerning Babylon is to destroy it, for that is the vengeance of the LORD, vengeance for his temple. for the LORD has both planned and done what he spoke concerning the inhabitants of Babylon. and they shall raise a shout of victory over you. He makes lightnings for the rain, and he brings out the wind from his storehouses. for their images are false, and there is no breath in them. 18 They are worthless, a work of delusion; at the time of their punishment they shall perish. and Israel is the tribe of his inheritance; the LORD of hosts is his name. 23 with you I smash shepherds and their flocks; with you I smash farmers and their teams; with you I smash governors and deputies. 24 I will repay Babylon and all the inhabitants of Chaldea before your very eyes for all the wrong that they have done in Zion, says the LORD. but you shall be a perpetual waste, says the LORD. prepare the nations for war against her, summon against her the kingdoms, Ararat, Minni, and Ashkenaz; appoint a marshal against her, bring up horses like bristling locusts. with their governors and deputies, and every land under their dominion. to make the land of Babylon a desolation, without inhabitant. her buildings are set on fire, her bars are broken. 32 the fords have been seized, the marshes have been burned with fire, and the soldiers are in panic. yet a little while and the time of her harvest will come. he has filled his belly with my delicacies, he has spewed me out. 35 May my torn flesh be avenged on Babylon,” the inhabitants of Zion shall say. “May my blood be avenged on the inhabitants of Chaldea,” Jerusalem shall say. 36 Therefore thus says the LORD: I am going to defend your cause and take vengeance for you. an object of horror and of hissing, without inhabitant. 38 Like lions they shall roar together; they shall growl like lions’ whelps. until they become merry and then sleep a perpetual sleep and never wake, says the LORD. 40 I will bring them down like lambs to the slaughter, like rams and goats. 41 How Sheshach is taken, the pride of the whole earth seized! 42 The sea has risen over Babylon; she has been covered by its tumultuous waves. a land in which no one lives, and through which no mortal passes. 44 I will punish Bel in Babylon, and make him disgorge what he has swallowed. The nations shall no longer stream to him; the wall of Babylon has fallen. 45 Come out of her, my people! Save your lives, each of you, from the fierce anger of the LORD! the next year another, rumors of violence in the land and of ruler against ruler. her whole land shall be put to shame, and all her slain shall fall in her midst. for the destroyers shall come against them out of the north, says the LORD. 49 Babylon must fall for the slain of Israel, as the slain of all the earth have fallen because of Babylon. 50 You survivors of the sword, go, do not linger! for aliens have come into the holy places of the LORD’s house. and through all her land the wounded shall groan. from me destroyers would come upon her, says the LORD. 54 Listen!– a cry from Babylon! A great crashing from the land of the Chaldeans! 55 For the LORD is laying Babylon waste, and stilling her loud clamor. their bows are broken; for the LORD is a God of recompense, he will repay in full. they shall sleep a perpetual sleep and never wake, says the King, whose name is the LORD of hosts. and her high gates shall be burned with fire. The peoples exhaust themselves for nothing, and the nations weary themselves only for fire. This entry was posted in Jeremiah and tagged Babylonian Empire. Bookmark the permalink.